The AIM-54 Phoenix is a radar-guided, long-range air-to-air missile (AAM), carried in clusters of up to six missiles on the Grumman F-14 Tomcat, its only operational launch platform. The Phoenix was the United States' only long-range air-to-air missile. The combination of Phoenix missile and the AN/AWG-9 guidance radar was the first aerial weapons system that could simultaneously engage multiple targets. Due to its active radar tracking, the brevity code "Fox Three" was used when firing the AIM-54. Both the missile and the aircraft were used by Iran and the United States Navy. In US service both are now retired, the AIM-54 Phoenix in 2004 and the F-14 in 2006. They were replaced by the shorter-range AIM-120 AMRAAM, employed on the F/A-18 Hornet and F/A-18E/F Super Hornet—in its AIM-120D version, the latest version of the AMRAAM just matches the Phoenix's maximum range. The AIM-54 is credited with 62 air-to-air kills, all scored by Iran during the long Iran–Iraq War. Following the retirement of the F-14 by the U.S. Navy, the weapon's only current operator is the Islamic Republic of Iran Air Force. Since 1951, the Navy faced the initial threat from the Tupolev Tu-4K 'Bull' carrying anti-ship missiles or nuclear bombs. Eventually, during the height of the Cold War, the threat would have expanded into regimental-size raids of Tu-16 Badger and Tu-22M Backfire bombers equipped with low-flying, long-range, high-speed, nuclear-armed cruise missiles and considerable electronic countermeasures (ECM) of various types. This combination was considered capable of saturating fleet defenses and threatening carrier groups. The Navy would require a long-range, long-endurance interceptor aircraft to defend carrier battle groups against this threat. The proposed F6D Missileer was intended to fulfill this mission and oppose the attack as far as possible from the fleet it was defending. The weapon needed for interceptor aircraft, the Bendix AAM-N-10 Eagle, was to be an air-to-air missile of unprecedented range when compared to contemporary AIM-7 Sparrow missiles. It would work together with Westinghouse AN/APQ-81 radar. The Missileer project was cancelled in December 1960. In the early 1960s, the U.S. Navy made the next interceptor attempt with the F-111B, and they needed a new missile design. 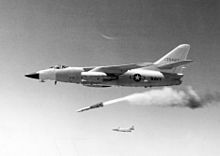 At the same time, the USAF canceled the projects for their land-based high-speed interceptor aircraft, the North American XF-108 Rapier and the Lockheed YF-12, and left the capable AIM-47 Falcon missile at a quite advanced stage of development, but with no effective launch platform. The AIM-54 Phoenix, developed for the F-111B fleet air defense fighter, had an airframe with four cruciform fins that was a scaled-up version of the AIM-47. One characteristic of the Missileer ancestry was that the radar sent it mid-course corrections, which allowed the fire control system to "loft" the missile up over the target into thinner air where it had better range. The F-111B was canceled in 1968. Its weapons system, the AIM-54 working with the AWG-9 radar, migrated to the new U.S. Navy fighter project, the VFX, which would later become the F-14 Tomcat. In 1977, development of a significantly improved Phoenix version, the AIM-54C, was developed to better counter projected threats from tactical anti-naval aircraft and cruise missiles, and its final upgrade included a re-programmable memory capability to keep pace with emerging ECM. On the F-14, four missiles can be carried under the fuselage tunnel attached to special aerodynamic pallets, plus two under glove stations. A full load of six Phoenix missiles and the unique launch rails weighs in at over 8,000 lb (3,600 kg), about twice the weight of Sparrows, so it was more common to carry a mixed load of two Phoenix, three Sparrow, and two Sidewinder missiles. An AIM-54 hitting a QF-4B target drone, 1983. On January 5, 1999, a pair of US F-14s fired two Phoenixes at Iraqi MiG-25s southeast of Baghdad. Both AIM-54s' rocket motors failed and neither missile hit its target. On September 9, 1999, another US F-14 launched an AIM-54 at an Iraqi MiG-23 that was heading south into the no-fly zone from Al Taqaddum air base west of Baghdad. The missile missed, eventually going into the ground after the Iraqi fighter reversed course and fled north. An AIM-54 Phoenix being attached to an F-14 wing pylon before the forward fins were installed (2003). The AIM-54 Phoenix was retired from USN service on September 30, 2004. F-14 Tomcats were retired on September 22, 2006. They were replaced by shorter-range AIM-120 AMRAAMs, employed on the F/A-18E/F Super Hornet. Despite the much-vaunted capabilities, the Phoenix was rarely used in combat, with only two confirmed launches and no confirmed targets destroyed in US Navy service, though a large number of kills were claimed by Iranian F-14s during the Iran–Iraq War. The USAF F-15 Eagle had responsibility for overland combat air patrol duties in Operation Desert Storm in 1991, primarily because of the onboard F-15 IFF capabilities. The Tomcat did not have the requisite IFF capability mandated by the JFACC to satisfy the rules of engagement to utilize the Phoenix capability at beyond visual range. 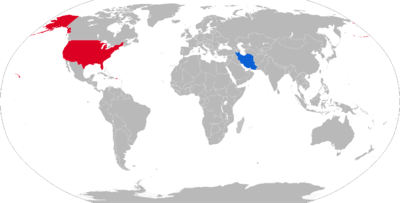 The AIM-54 was not adopted by any foreign nation besides Iran, or any other US armed service, and was not used on any aircraft other than the F-14. Iranian F-14 Tomcats armed with multiple missiles, including AIM-54 Phoenix, 1986. There is very little information available regarding Iran's use of its 79 F-14A Tomcats (delivered prior to 1979) in most western outlets. The exception is a book released by Osprey Publishing titled Iranian F-14 Tomcats in Combat by Tom Cooper and Farzad Bishop. Most of the research contained in the book was based on pilot interviews. Reports vary on the use of the 285 missiles supplied to Iran, during the Iran–Iraq War (1980–1988), and achieving at least 78 victories against Iraqi MiG-21/23/25s, Mirage F-1s, Super Étendards, and even one AM-39 Exocet and one C-601 anti-ship cruise missiles. The US refused to supply spare parts and maintenance after the 1979 revolution, except for a brief period during the Iran-Contra Affair. According to Cooper, the Islamic Republic of Iran Air Force kept its F-14 fighters and AIM-54 missiles in regular use during the entire Iran–Iraq War, though periodic lack of spares grounded large parts of the fleet at times. During late 1987, the stock of AIM-54 missiles was at its lowest, with fewer than 50 operational missiles available. The missiles needed fresh thermal batteries that could only be purchased from the US. Iran found a clandestine buyer that supplied it with batteries, which cost up to US$10,000 each. Iran received spares and parts for both the F-14s and AIM-54s from various sources during the Iran–Iraq War, and has received more spares after the conflict. Iran started a program to build spares for the planes and missiles, and although there are claims that it no longer relies on outside sources to keep its F-14s and AIM-54s operational, there is evidence that Iran continues to procure parts clandestinely. Both the F-14 Tomcat and AIM-54 Phoenix missile continue in the service of the Islamic Republic of Iran Air Force. Iran claimed to be working on building an equivalent missile and in 2013 unveiled the Fakour-90, an upgraded and reverse-engineered version of the Phoenix. Original model that became operational with the U.S. Navy in about 1974, and it was also exported to Iran before the Iran hostage crisis beginning in 1979. Also known as the 'Dry' missile. A version with simplified construction and no coolant conditioning. Did not enter series production. Developmental work started in January 1972. 7 X-AIM-54B missiles were created for testing, 6 of them by modifying pilot production IVE/PIP rounds. After two successful test firings, the 'Dry' missile effort was cancelled for being "not cost effective". The only improved model that was ever produced. It used digital electronics in the place of the analog electronics of the AIM-54A. This model had better abilities to shoot down low and high-altitude antiship missiles. This model took over from the AIM-54A beginning in 1986. More capabilities in electronic counter-countermeasures. It did not require coolant conditioning during flights on board F-14s and not fired (the usual situation). Deployed beginning in 1988. Because the AIM-54 ECCM/Sealed received no coolant, F-14s carrying this version of the missile could not exceed a specified airspeed. There were also test, evaluation, ground training, and captive air training versions of the missile; designated ATM-54, AEM-54, DATM-54A, and CATM-54. The flight versions had A and C versions. The DATM-54 was not made in a C version as there was no change in the ground handling characteristics. A 1970s proposal for a ship launched version of the Phoenix as an alternative/replacement for the Sea Sparrow point defense system. It would also have provided a medium-range SAM capability for smaller and/or non-Aegis equipped vessels (such as the CVV). The Sea Phoenix system would have included a modified shipborne version of the AN/AWG-9 radar. Hughes Aircraft touted the fact that 27 out of 29 major elements of the standard (airborne) AN/AWG-9 could be used in the shipborne version with little modification. Each system would have consisted of one AWG-9 radar, with associated controls and displays, and a fixed 12-cell launcher for the Phoenix missiles. In the case of an aircraft carrier, for example, at least three systems would have been fitted in order to give overlapping coverage throughout the full 360°. [page needed] Both land and ship based tests of modified Phoenix (AIM-54A) missiles and a containerised AWG-9 (originally the 14th example off the AN/AWG-9 production line) were successfully carried out from 1974 onwards. A land based version for the USMC was also proposed. 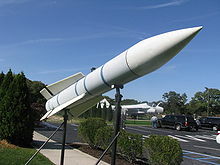 It has been suggested that the AIM-54B would have been used in operational Sea Phoenix systems, although that version had been cancelled by the second half of the 1970s. Ultimately, a mix of budgetary and political issues meant that, despite being technically and operationally attractive, further development of the Sea Phoenix did not proceed. In February 2013 Iran reportedly tested an indigenous long-range air-to-air missile. In September 2013 it displayed the Fakour-90 on a military parade. It looked almost identical to the AIM-54 Phoenix. In July 2018 as reported by Jane's, Iran started mass production of the Fakour-90. ^ the great book of modern warplanes. New York City: Salamander Books Ltd. 1987. ^ "New long-range missile project emerges in US budget". November 2, 2017. ^ John Stillion. "Trends in Air-to-Air Combat: Implications for Future Air Superiority" (PDF). Center for Strategic and Budgetary Assessments (CSBA). p. 22. ^ Zaloga, S.J. ; Laurier, J. (2005). V-1 Flying Bomb, 1942–52: Hitler's Infamous "Doodlebug". Osprey Publishing, Limited. ISBN 9781841767918. Retrieved 3 October 2014. ^ "Raytheon AIM-54 Phoenix". designation-systems.net. Retrieved 3 October 2014. ^ a b "AIM-54" (2004). Directory of US Military Rockets and Missiles. Retrieved 28 November 2010. ^ "Defense.gov Transcript: DoD News Briefing January 5, 1999". ^ Parsons, Dave, George Hall and Bob Lawson. (2006). Grumman F-14 Tomcat: Bye-Bye Baby...! : Images & Reminiscences From 35 Years of Active Service. Zenith Press, p. 73. ISBN 0-7603-3981-3. ^ Tony Holmes, "US Navy F-14 Tomcat Units of Operation Iraqi Freedom", Osprey Publishing (2005). Chapter One – OSW, pp. 16–7. 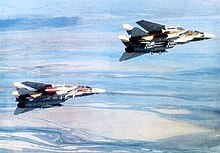 ^ a b "Book: Iranian F-14 Tomcat Units in Combat". Acig. Archived from the original on 30 January 2010. Retrieved 3 February 2010. ^ "Iranian Air Force F-14". Aerospace Web. Retrieved 3 February 2010. ^ Theimer, Sharon. "Iran Gets Army Gear in Pentagon Sale". Forbes. Archived from the original on 19 January 2007. Retrieved 17 January 2007. ^ Iran eyes missile stronger than Phoenix, IR: Press TV . ^ Cenciotti, David. "Iranian F-14 Tomcat's 'new' indigenous air-to-air missile is actually an (improved?) AIM-54 Phoenix replica". The Aviationist. Retrieved 8 November 2015. ^ "Budget estimates descriptive summaries", Supporting data for fiscal year 1983, Department of the Navy . ^ Weapon Systems, Jane's, 1977 . ^ Tarpgaard, PT (1976), "The Sea Phoenix—A Warship Design Study", ASNE, 88 (2): 31–44 . ^ Iran test-fires latest air-to-air missile, IR: Press TV, Feb 10, 2013, archived from the original on 2013-09-30 . ^ "Farouk missile", The Avionist, Sep 26, 2013 . ^ "Fact File: AIM-54 Phoenix Missile". U.S. Navy. Archived from the original on 29 June 2011. Retrieved 14 July 2011. Wikimedia Commons has media related to AIM-54 Phoenix. This page was last edited on 10 March 2019, at 08:46 (UTC).